Donal Drohan, originally from Waterford, died when a tree fell on his car in Watford at about 6.50am. Three others were killed in the UK and four more elsewhere in northern Europe. 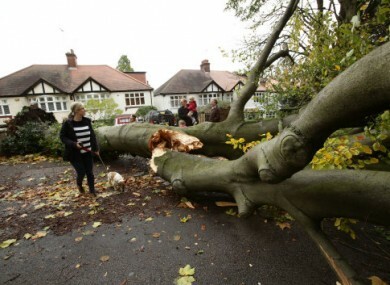 A 51-YEAR-OLD Irishman was among four people who have been killed by a storm that ripped through southern Britain early this morning. Donal Drohan, originally from Waterford, died at the scene when a tree fell on his car in Watford at about 6.50 am according to Hertfordshire police. A man and a woman were killed elsewhere in Hounslow in London after three houses collapsed in an explosion thought to have been caused after a gas pipe was ruptured in the storm. A 17-year-old girl in Hever, Kent was also killed when a tree fell on the caravan in which she was sleeping. The incident occurred around 7.20am this morning. Rough conditions at sea also forced rescuers to abandon the search for a 14-year-old boy who disappeared while playing in the surf on a southern English beach on yesterday. British Prime Minister David Cameron described the loss of life as “hugely regrettable”. Some 270,000 homes lost power across Britain with a disruption across rail, sail and plane travel. There were further deaths in northern Europe as a result of the storm named St. Jude in the UK and Christain in France. Two people died in Germany, one in The Netherlands and another in France as heavy rain and high winds battered the entire region overnight and into the morning. Email “Irishman among four killed by storm in the UK”. Feedback on “Irishman among four killed by storm in the UK”.